Sometimes the item you are shipping just won’t fit in any available box! With its weird angles, funky corners or curves, it seems an impossible task to pack it correctly for that 1,300 mile trip to your mother for her birthday. How do you pack that special item so it arrives at its destination in one piece? You’ve checked for the right box size but it doesn’t exist which means you may have to try to create a custom box yourself. There is an actual art to making one of those and it is rarely an easy process for the untrained. It might require putting 2 or more boxes together to approximate the fit you need. Then, it’s time to select the appropriate bubble-wrap, packing peanuts, or other inside padding to shield the item against mayhem along the 1,300-mile route. This is all very time consuming, confusing, expensive and a major inconvenience with no guarantee that the item will reach its destination intact! 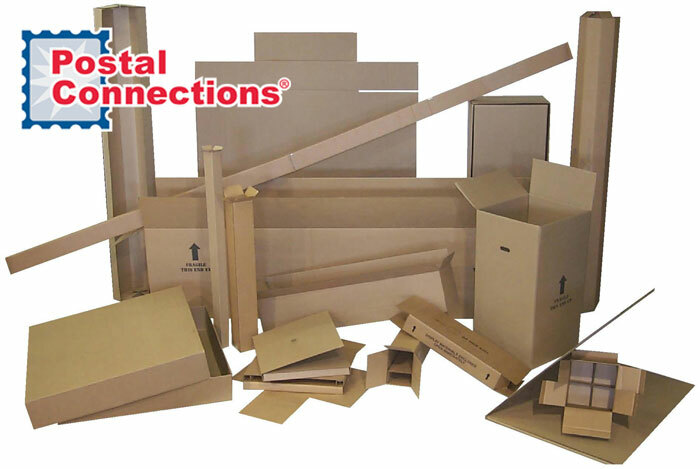 At Postal Connections we have the training and experience to create that custom box and save you the hassle. Our packing experts will professionally pack and ship your oddly shaped, fragile, special and valuable items to ensure their safe arrival. The Postal Connections guarantee provides peace of mind because your items are packed to meet or exceed any and all carrier requirements. If any damage or loss occurs during transit, your Postal Connections store stands behind the packaging, guaranteeing it for insurability. At Postal Connections our specialty is packing and shipping, printing and copying, mailbox rental, custom print/design and more! We’re here for all your business needs! Note, not all services are offered by all stores. Please contact your local store for more information on offered services.